From Caligula to Hitler to Caeusescu to John Prescott, deluded Big Government autocrats have always loved bulldozing other people's homes to erect their Thousand Year monuments. A key part of Prescott's plan was called Housing Market Renewal, the grandiose project to rebuild the North and parts of the Midlands (see previous blogs eg here). Organised around nine local "pathfinders", it involved the demolition of 90,000 homes and was to cost taxpayers £2.2bn. The half-baked idea was somehow to trigger economic regeneration by replacing the housing stock. Oh, and from Salford to Blackburn to Gateshead, virtually all the areas involved happened to be Labour constituencies. But what was that to the Commissars? "It is a high risk approach... there is no guarantee that intervening in the housing market in this way will address the causes rather than the symptoms of the problems experienced in these neighbourhoods. If the programme is to justify the additional value for money risk and community stress of its housing market-led approach and achieve its long-term objectives, the Department needs to provide greater certainty and clarity over the future objectives and governance of the programme." Translation: they're spending billions of taxpayers' money with no clear idea what they're doing and no measurable impact on economic regeneration. High staff turnover- "...turnover and lack of continuity in staffing and approach has also resulted in the Department having difficulty in keeping track of the performance information that it received from pathfinders. Shambolic record keeping- "Much of this information was missing from Departmental records at the time of the National Audit Office’s examination and the pathfinders themselves were unable to fill the gaps..."
Even with unlimited access to our wallets, Big Government is simply incapable of organising delivery. So that's another £2.2bn down the drain. And remember this- there is absolutely no evidence that these huge regional regeneration programmes do any good whatsoever. Ever since the thirties, successive governments- but especially this one- have shovelled huge amounts of our cash into "kick-starting" the economies of our underperforming regions. And yet somehow, whatever they do, whatever bribes or regulation they try, the underperformance never seems to go away. The regions which are problems today are virtually the same regions that were problems in the 1930s: Wales, the North East, Merseyside... it's almost as if they're beyond redemption. As blogged here yesterday, Policy Exchange has just published an interesting paper on a key aspect of this- failing cities. The paper, by Tim Leunig and James Swaffield, runs through the history of cities, their importance in economic development, and the sorry tale of regional support operations for Britain's old heavy industry capitals. The bottom line is that despite all the grants, all the tax-breaks, all the planning regulations, all the Special Task Forces, and all the Regeneration Czars, these cities- and the regions that surround them- have never managed to re-fire the self-sustaining growth that produced them in the Nineteeth Century. The paper looks at "18 towns and cities that have been recipients of significant urban policy intervention, particularly in the past ten years.... large cities such as Sheffield, as well as smaller towns such as Hastings and Blackburn, Stoke and Bradford; it covers a broad swathe of Britain, from Merthyr Tydfil in theWest to Hull in the East, from Glasgow in the North to Southampton in the South." Needless to say, there is a big overlap with the cities targeted by the Pathfinders. 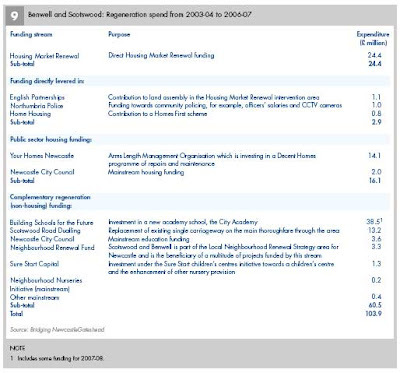 "By 2003 the regeneration minister, Lord Rooker, described its ever greater complexity as “a bowl of spaghetti”; the Guardian newspaper identified 46 different urban policy funding streams. specific, the Drug Action Teams and Youth Music Action Zones. Only a few years on it can be hard to remember the distinction between the Early Years Development and Childcare Partnerships and the Neighbourhood Nursery Centres, between the Crime Reduction Programme and the Safer Communities Initiative, between Spaces for Sport and the Arts and Sports Action Zones." One thing Labour has been very keen on is regeneration via what's known as the "built environment". The Pathfinders are one manifestation, but another is all those glossy "arts centres" plonked down in "deprived cities" everywhere from Gateshead to Middlesborough ("Middlesbrough Quarter offers all forms of dancing – including Morris dancing"). So what do they achieve? "Even at its peak it employed only 79 people – which, with a £15 million cost, means that each job cost £190,000. Today the Leicester Performing Arts centre states that it is aiming to create 134 jobs – with a project cost of £50 million, this would be £373,000 a job." And that pretty well sums up the whole regional programme. The results in terms of economic regeneration are virtually non-existent. As we can see, despite all that support- too great even to enumerate- the relative economic position of the recipients has got worse. The authors are writing two further papers in which they will spell out their ideas. But some things seem clear. First, we may need to recognise that most of these depressed cities are simply in the wrong place. We no longer need to be next to coal fields, and we no longer need to be at the end of Atlantic sea lanes. This is the locational view of decline- about which we can do little- as opposed to the structural/industrial view, which says we just need to find some new industry for these cities to do. Second, we should stop all policies that increase employment costs in depressed regions. This crazy Prescott scheme was deliberately targeted on increasing local house prices thus undermining a key competitive advantage. And paying the same benefit rates and public sector salaries, however low local costs and private sector pay levels are, is also deeply corrosive (eg see this blog). Third, we should implement full fiscal decentralisation (eg see this blog). That way, local authorities themselves have a strong interest in building their local business base through whatever means they can. And not waiting to be steamrollered by Whitehall.